The Purple Agency: Purple win double at RAR Awards 2017! Purple win double at RAR Awards 2017! We are thrilled to announce that Purple have won two awards at the annual Recommended Agency Register Awards - Best in Data and Production in the 100+ Staff category. It was celebrations all round at the Marriott Hotel in London last night, when the best and brightest from agency land collected to celebrate the campaigns and marketing achievements of the last year. 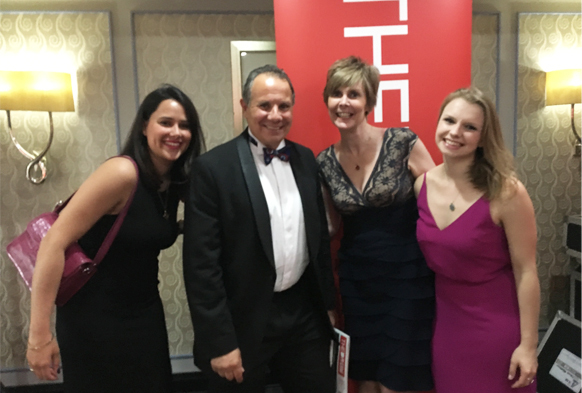 Four of our Purple People attended the coveted awards; Emma Woodford, Andrew Woodger, Zoe Lock and Annie Dean (ABOVE) representing Purple’s Data, Healthcare, B2B and B2C teams. The evening included a delicious meal, followed by some entertainment from comedian Sean Collins and, of course, plenty of celebrating! These awards are particularly important for Purple, as the judging is based solely on ratings and reviews from our clients. We would like to say a massive congratulations to all of the successful agencies. For a full list of winners, please visit the RAR Awards website – www.recommendedawards.com.